The modeling process for architectural visualization is very different from projects dealing with organic shapes. With organic shapes we can focus in the approximated proportion of the model and organize the topology of the model to receive good deformations, when the model is animated. For models used in architectural visualization projects the focus is on exact proportions and geometrical shapes, which won`t be deformed in animation. A few tools left aside in organic modeling are heavily used in architectural modeling like the Boolean operations and the snapping tools. Even with those small differences between organic and architectural modeling, there are a few techniques and tools that could be applied to objects, no matter what software you use. For instance, if you learn to use the extrude tool, you will be able to create models on almost any 3d software. That`s the reason to study and read materials related with any 3d package involving architectural modeling. If you want to learn a few techniques about 3d modeling for architecture using Modo 3D, an artist called Ernesto Pacheco released a set of three tutorials showing architectural modeling techniques with Modo 3D. This set of tutorials is a preview of a future training that the artist will release about architectural visualization with Modo. From the three tutorials, I recommend you to watch at least the second and third videos, which deals with topics such as precision modeling, Boolean operations and more about modeling with the software. The last video will show how to import and prepare CAD files, more precisely DWG files, to use in architectural modeling projects. It`s quite interesting to see how a proprietary software like Modo, not related to Autodesk deals with DWG files. At the beginning of the third video, the artist shows how to use the EveryDWG file converter from the Open Design Alliance to convert files from DWG to DXF. This is an example that Modo artists have to do some workarounds to import CAD files inside Modo. To be able to edit the files, as a final step with the CAD drawings, the author converts the design to LWO and imports the drawings to Modo. 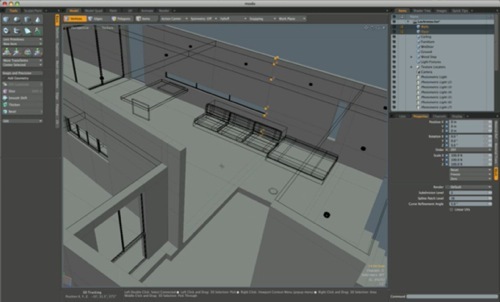 For artists that uses Blender 3D to create architectural visualization, some of the tools showed in the tutorials have no practical application, but as a free educational source for architectural modeling, the videos are mostly welcome.